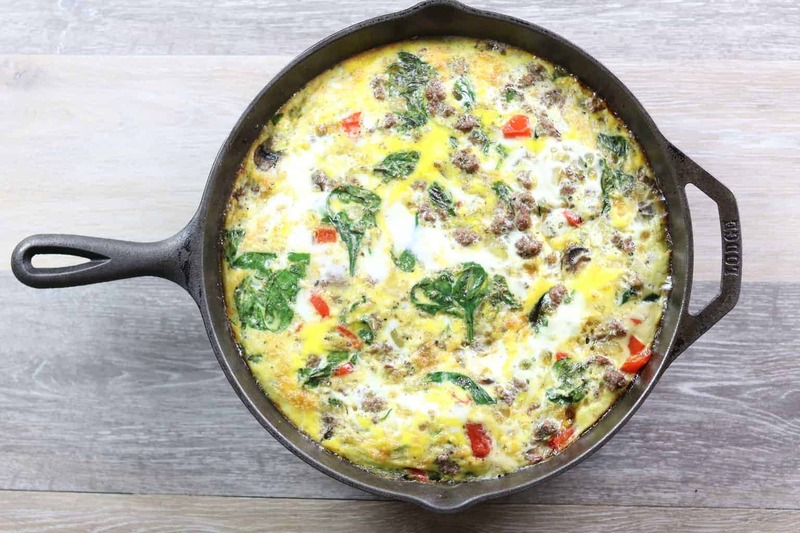 LEARN HOW TO MAKE THE BEST WHOLE 30 BREAKFAST CASSEROLE WITH THIS SIMPLE RECIPE. PLUS, GRAIN FREE WHOLE 30 OATMEAL AND MORE WHOLE 30 HEALTHY BREAKFAST IDEAS. 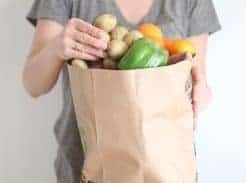 Grab my whole 30 ebook for a full week menu plan and complete grocery list. When I thought about making a blog post about whole 30 breakfast ideas, I wasn’t sure what I was going to put in it. Breakfast can be pretty boring, especially when you aren’t eating grains or dairy. 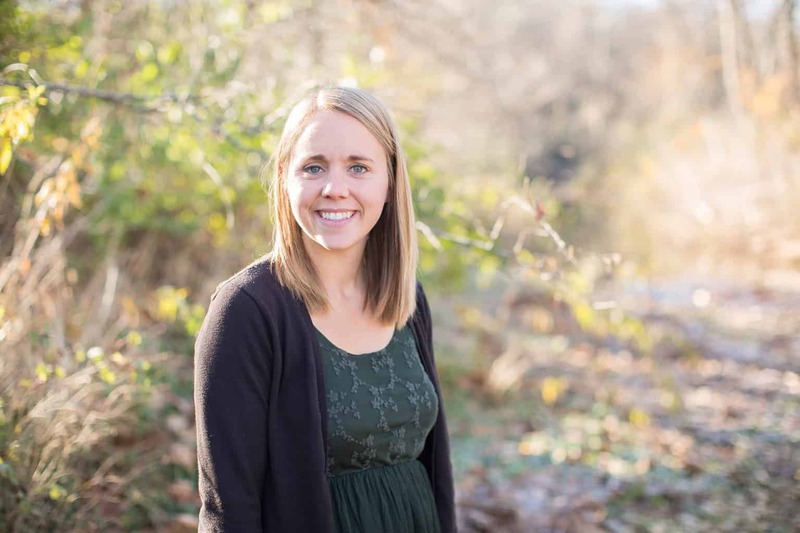 However, after some pondering and being on the whole 30 for almost a month I have some fun ideas for you. Don’t get me wrong, most mornings you will see fried eggs, avocados, and sauerkraut on my plate, but if you have access to a whole foods type store you can jazz it up! 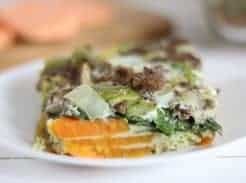 I am going to share my favorite whole 30 approved breakfast casserole, along with a few other ideas to help you have an easy and healthy breakfast. Brown breakfast sausage in a cast iron skillet over medium heat. As it is cooking dice up the vegetables. Once the meat is browned, remove it from the pan. Add in the coconut oil. Once it is melted you can sauté the vegetables. Throw in the handfuls of spinach and stir until well combined. Turn heat to low and let simmer for 2-3 minutes to allow spinach to wilt. In a separate bowl add the eggs, liquid of choice, salt, and pepper. Whisk together until everything is well combined. Pour the egg mixture over the meat and veggies. Transfer cast iron skillet to the preheat oven. bake 45 minutes or until the eggs are set. HOMEMADE SAUSAGE- Brown one pound of meat (you can use beef, turkey, or pork). Stir in 1 teaspoon black pepper, 1 tablespoon Italian seasonings, 1 teaspoon garlic powder, 1 teaspoon onion powder, and 2 teaspoons salt. 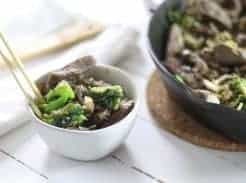 You can use this same recipe and switch out the vegetables and meat to make a different style of casserole. Try substituting the sausage for whole 30 approved bacon. Add in diced tomatoes and fresh basil. Get creative and have fun with this! These casseroles are perfect to make at the beginning of the week and then you can just warm it up in the morning before rushing out the door for work or school. Unless, your family is like mine and eats this all in one sitting!! 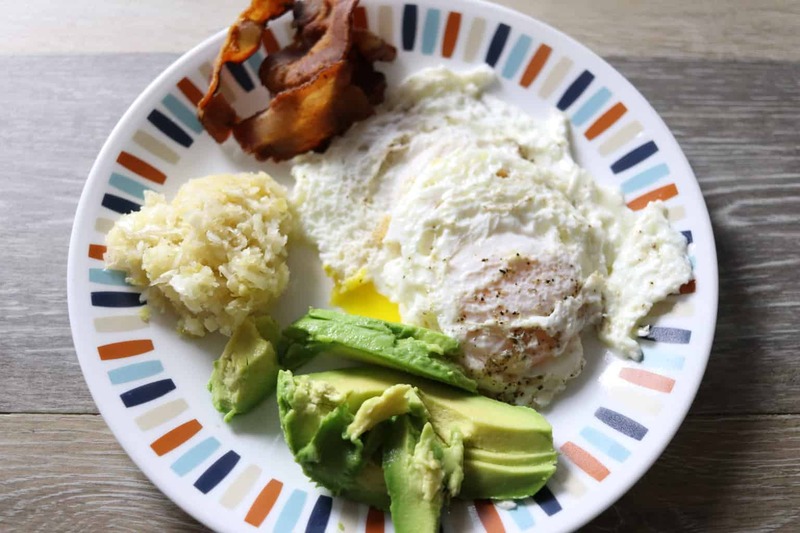 A simple yet delicious whole 30 breakfast. To make the best fried eggs: Heat up a cast iron skillet over medium heat, sprinkle some water on the skillet to make sure it sizzles before adding the eggs. Crack the eggs on the skillet and sprinkle with salt and pepper. Only flipping once, flip the eggs after 2 minutes. If you are like me, remove the skillet from the heat at this time to allow it to cook slightly. I like my eggs over easy! Serve with sliced avocados, bacon, and fresh fruit. I also love sauerkraut with this! Mix the nuts, coconut flour, dates, chia seeds, coconut, cinnamon, and salt in a bowl. Heat the milk over low to medium heat, until warm. Pour the milk over the dry ingredients and stir. As it sits it will thicken up. Top with desired toppings. Chopped apples is our favorite! Heat up a cast iron skillet over medium heat and add coconut oil. Add sweet potatoes and red potatoes. Let cook for 5 minutes and then flip them over. Add in onion at this time. While the potatoes and onions are cooking, chop the polish sausage into small pieces. Add in the polish sausage and cover the skillet with a lid. Countine to cook until all the potatoes are soft. Add 2 large handfuls of spinach. Crack 6 eggs on top, salt and pepper to taste, and then bake in a preheated oven for 10 minutes or until the eggs are set. You can find sugar free, whole 30 approved polish sausage at most health food stores. We served this breakfast with slices of avocado and sauerkraut. Heat coconut oil in small skillet, add vegetables, and let them sauté. While vegetables are cooking, whisk the eggs in a small bowl. Add salt and peeper and stir well. Remove vegetables from the skillet and add the egg mixture. Allow the eggs to cook for about 2-3 minutes or until they are set and pour vegertables on one half of the eggs. Gently flip the side without vegetables on top of the other side. Flip the omelet over and allow to cook until eggs are done. 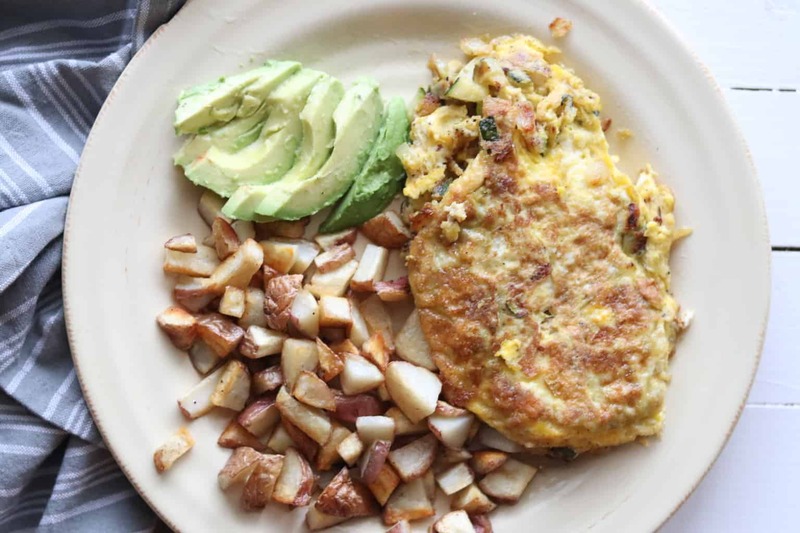 Serve with hash browns, sauerkraut, and fruit salad. FOR THE HASH BROWNS- Dice up red potatoes and toss them in melted coconut oil and salt. Spread them onto a baking dish and bake in a 400 degree oven until soft and browned. 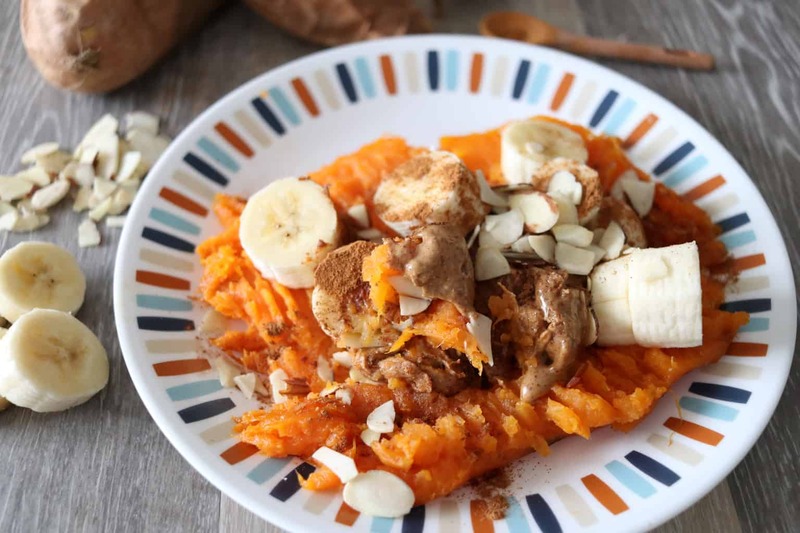 Last week I shared a few snack ideas and one of them was a loaded sweet potato. This snack would also work great for an easy, healthy whole 30 breakfast. 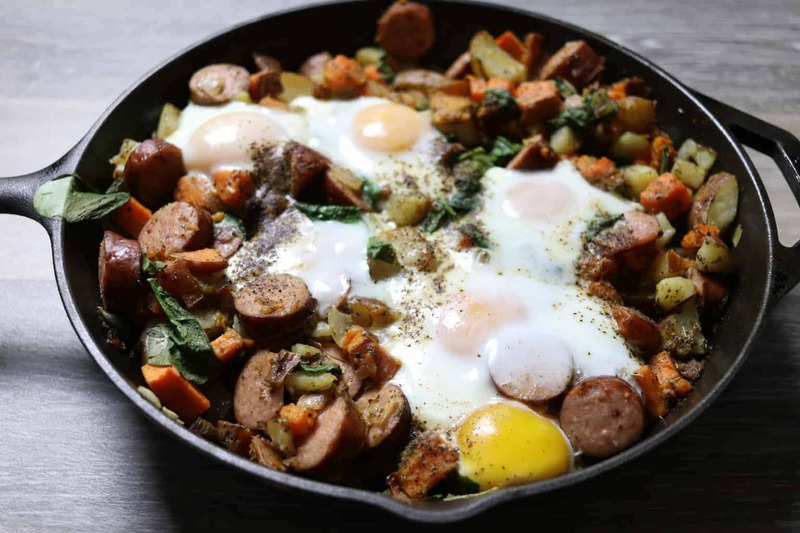 Avocado, breakfast sausage, and eggs is a great whole 30 breakfast that is loaded with protein and vitamins. Apples, carrots, and celery slices dipped in almond butter. Sprinkle with cinnamon and raisins. Hard boiled eggs served with fresh fruit. What are your go to healthy breakfast meals? Share your favorites in the comments below! I’m going to try this the next time I make a breakfast casserole! 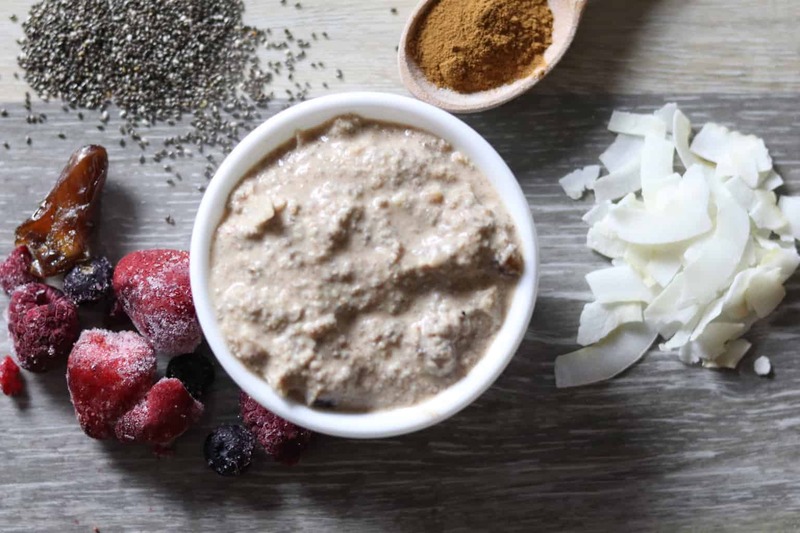 That oatmeal sounds/looks amazing! Thanks! I hope you enjoy these recipes! Lyndsy says, thanks! And thanks for sharing your great posts every week! You’re welcome! Thanks for following along!